I think of Thanksgiving dinner as existing in tiers of necessity. First, there must be a turkey. That’s non-negotiable (unless you’re a vegetarian, of course, but we’re talking Norman Rockwell here). Turkey is a core necessity. Next tier: gravy, cranberry sauce, stuffing, mashed potatoes, pie. Some variation is allowed there, giving allowance to individual preference (I MUST have sage stuffing, my husband MUST have pumpkin pie.) After that some green vegetable (probably green beans or brussels sprouts), some orange vegetable (probably sweet potatoes). Preparation can vary widely. And finally, other assorted side dishes, where the variety is unlimited and depends on your family tradition – tomato aspic, cottage cheese jello “salad”, braised endives, parsnip gratin … the list is endless. Our family is big enough that we get lots of variation in Thanksgiving dinner. After the first couple tiers, we tend to go a little crazy with trying new recipes, and throwing weird vegetables into the mix. Last year my mom brought this roasted green bean dish, and it was one of my favorite things on the table. With all the richness on the Thanksgiving table – stuffings and gravies and gratins – a lighter, simpler vegetable dish can be a real relief. In this case, however, simple doesn’t mean boring. 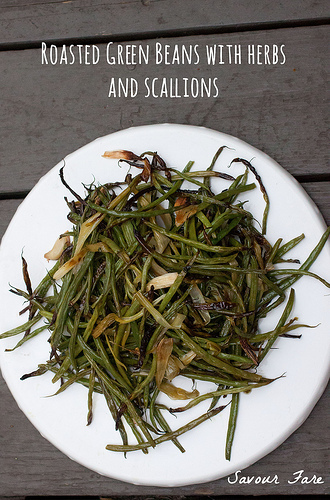 The preparation is easy, but the long, slow roast allows the beans and scallions to soften, the garlic and scallions to caramelize, and the herbs to perfume the whole dish. 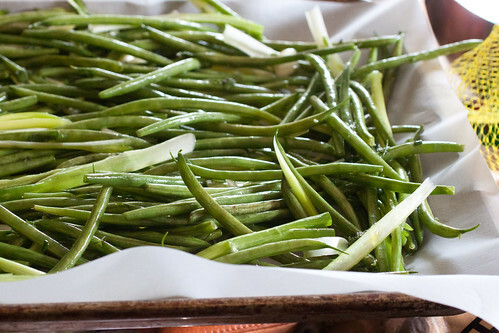 It’s a lovely addition to your Thanksgiving table, or any party, and might just become your core Thanksgiving dish. In large bowl, toss all ingredients together. Spread them on a large rimmed baking sheet, lined in foil. Bake for one hour, stirring every 15 minutes (I found tongs to be the easiest way to stir). Serve warm.